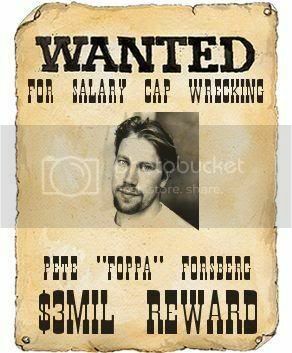 Can I just weigh in on the Peter Forsberg sweepstakes for a few minutes? Look, I'm all for teams trying to improve themselves for an anticpated long run in the playoffs. That's what the trade deadline is for, that's what the roster freeze is for, that's what the salary cap is for - all work to make the NHL more competitive, and allows those with cap space to improve their teams with pieces they see fit to make that long playoff run. So I pose this question to all NHL general managers: why would you sign Peter Forsberg if you're trying to win a Stanley Cup? Let me preface this by saying that Peter Forsberg, when healthy, is an all-world talent. The guy is heads and shoulders above most NHL players, even when playing on a wonky foot. However, it's that wonky foot that has kept him off the ice since Nashville took an early exit from the playoffs last season. I get that he's an unrestricted free agent, thus allowing him to choose whatever team he likes in pursuit of a contract. That's his right, and I have no problem with that. I do, however, have a serious problem with his personal "elimination announcements" that seem to crowd the NHL headlines. I'm going to give you the Forsberg update you all want to hear. The only difference is that I'm going to do it like Dr. Seuss would. I will not play for Nashville. I will not play for LA. I will not play for Toronto. And I'm not interested in Modo. But I could hear offers from Chicago. And signing with Dallas would be silly. Because we all know I'll sign with Philly. Now, you've probably grown tired of my rant already, but let me actually back up my rant with some honest-to-goodness information. 1. NHL teams that stay realtively quiet at the deadline win Stanley Cups. Here's a quick list of teams that swung deals at the deadline before winning the Stanley Cup. - 2007: Anaheim obtains F Brad May from Colorado for G Michael Wall, obtains D Doug O'Brien from Tampa Bay for D Joe Rullier. - 2006: Carolina obtains veteran RW Mark Recchi from Pittsburgh for LW Niklas Nordgren, C Krys Kolanos and Carolina's second-round choice in 2007. - 2003: New Jersey Devils obtain RW Grant Marshall from Columbus for a conditional choice in 2004, and D Richard Smehlik and a conditional choice from Atlanta for a fourth-round choice in 2003 (Michael Vannelli). - 2000: New Jersey Devils obtain RW Alexander Mogilny from Vancouver for C Brendan Morrison and C Denis Pederson. Now, there have been blockbuster deals at the deadline, but it goes to show that teams that stay relatively quiet and don't mess with chemistry seem to do better than teams that wheel-and-deal at the deadline. 2. Injuries are magnified in the playoffs. Since the 2000-01 season, Peter Forsberg has only played in 304 regular season NHL games, or an average of 43 games per season. He's been a very good player in those games, averaging 54 points per season. However, he's also played 60 NHL playoff games in that same time. What may surprise you is that Forsberg's teams have not missed the playoffs in the last seven years. The last time a team he played on advanced past the second round was 2001-02, though. That's six years ago, and before he underwent many surgeries. Is he the same player as he was in 2002-03 when he won the Hart Trophy? Are you willing to take that risk with your team? 3. He hasn't played in the NHL this season. If you're a general manager, how many games will it take for Forsberg to get in NHL shape? If you're Ottawa or Anaheim or Philadelphia, are you willing to allow your team to struggle while Forsberg plays his way into NHL shape? And if his goal is to win a Stanley Cup, will he be ready to play in the Stanley Cup Playoffs when the intensity gets turned up a few more notches? Personally, I don't think he will make a difference on any team he joins. His addition to the Predators last season, and reunion with Paul Kariya, was all but a disappointment as the Predators played five games before packing their bags. 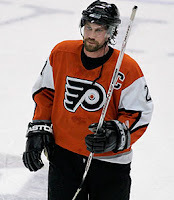 The year before, he played a total of six playoff games with Philly. I'm not saying anything about history, but a wise man once said, "those who do not know history are condemned to repeat it". The NHL and NHLPA need to institute some sort of policy that prevents unrestricted free agents from sitting out 75% of the season. This is absolutely ridiculous. Congratulations to whatever team gets Forsberg. Just don't expect me to sound the trumpets and roll out the red carpet. High risk, little reward. Doesn't seem like a very good investment, does it? I seriously hope the Preds don't do something stupid again. Look how well it worked out last year. Forsberg needs to go to Colorado. Two reasons. First, he's used to the environment and played well there. Second, the Avalanche are hurting from injuries and need experienced help. The young guys are doing well, but there is no substitute for experience. That said, if I was a GM I wouldn't touch him. The ankle is iffy and I would wonder about his desire to play. It's a big gamble with a lot of money.